The Leaning Tower of Pisa is one of the most remarkable architectural structures from medieval Europe. 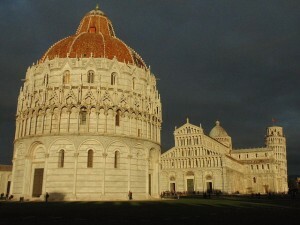 It is located in the Italian town of Pisa, one of the most visited European cities. Tower of Pisa stands at 60 metres and until 1990 was leaning at about a 10 degree angle. Although it was designed to be perfectly vertical, it started to lean during construction. 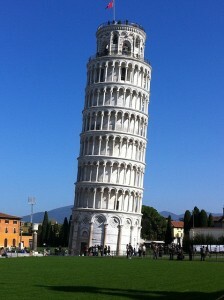 » Here you can see more Facts about Leaning Tower of Pisa. Tower of Pisa is more accurately referred to simply as the bell tower, or campanile. The Pisa tower is one of the four buildings that make up the cathedral complex in Pisa, Italy, called Campo dei Miracoli or Piazza dei Miracoli, which means Field of Miracles. The first building constructed at Campo dei Miracoli, Pisa, was the cathedral, or Duomo di Pisa, which rests on a white marble pavement and is an impressive example of Romanesque architecture. The next building added was the baptistery just west of the dome.Then work on the campanile began. Before the work on the campanile was completed the cemetery, Campo Santo, was built. 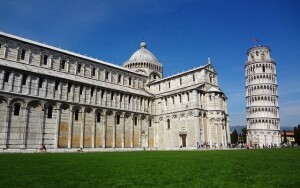 Piazza dei Miracoli of Pisa is the most splendiferous assemblage of Romanesque architecture in Italy. Faced in gray-and-white striped marble and bristling with columns and arches, the cathedral, with its curiously Islamic dome and matching domed baptistery, rises from an emerald green lawn. Flanking one side of the piazza, the camposanto, or cemetery, is a gracefully elongated cloister enclosing a burial ground with earth reputedly brought back during the Crusades from Golgotha, the hill where Jesus was crucified, so that noble Pisans could rest in holy ground. 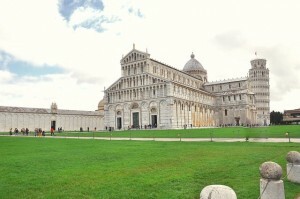 The Leaning Tower of Pisa is the piazza’s crowning glory. Although only a third as high as the Washington Monument, it was a miracle of medieval engineering, probably the tallest bell towers in Europe. With 207 columns ranged around eight stories, Tower of Pisa looks like a massive wedding cake knocked precariously askew by a clumsy giant guest. The construction of Tower of Pisa began in August 1173 and continued for about 200 years due to the onset of a series of wars. Till today, the name of the architect is a mystery. Leaning Tower of Pisa and CathedralThe leaning Tower of Pisa was designed as a circular bell tower that would stand 185 feet high. It is constructed of white marble. The tower has eight stories, including the chamber for the bells. The bottom story consists of 15 marble arches. Each of the next six stories contains 30 arches that surround the tower. The final story is the bell chamber itself, which has 16 arches. There is a 297 step spiral staircase inside the tower leading to the top. The top of the leaning tower of Pisa is about 17 feet off the vertical. The tower is also slightly curved from the attempts by various architects to keep it from leaning more or falling over. Many ideas have been suggested to straighten the Tower of Pisa, including taking it apart stone by stone and rebuilding it at a different location. In the 1920s the foundations of the tower were injected with cement grouting that has stabilized the tower to some extent. Until recent years tourists were not allowed to climb the staircase inside the tower, due to consolidation work. But now the leaning Tower of Pisa is open again and it is one of the most popular tourist attractions in Italy → Book a Hotel or check our → Visit Tower of Pisa page.